The most common intake manifold used for both 428 Cobra Jet and Super Cobra Jet engines from 1968 through 1970 is easily identified. It's a cast iron, 4v dual plane design that carries engineering number C8OE-9425-C. 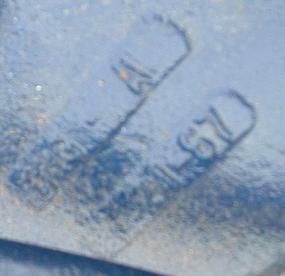 According to Chris Teeling, some early 1968 CJs came equipped with an intake carrying engineering number C80E-9425-A. 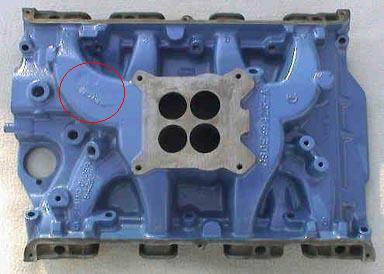 Chris says "The -A more resembles a 428 PI intake casting. The size of the engineering numbers are much larger and there is "XE" number on the #1 runner which is partially ground off" (more on the -A intake below). 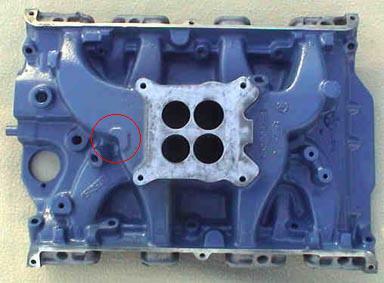 The engineering number can be found towards the back of the manifold, just behind the carburetor mounting area as shown in the picture on the left below. The casting date can be found just a little further towards the back of the manifold as shown in the picture on the right below. Those holes just to the above left of the casting date are used to mount the accelerator cable bracket. C8OE-9425-C engineering number detail. Casting date detail, 9K2 (October 2, 1969) shown. 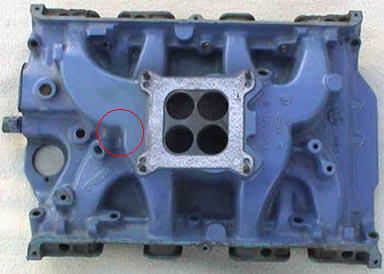 This intake manifold, like all FE intake manifolds, is a "wet" (coolant flows through it) intake that extends under the valve covers when installed. In the picture below you'll notice holes above the intake ports for the push rods, intake ports, and passages for engine coolant. Aluminum 428 Police Interceptor (PI) intakes are a popular replacement since they interchange readily and weigh a whole lot less (about 25 pounds) than this 75 pound cast iron monster! However, they are not original to regular production 428 Cobra Jets. 1969 and 1970 owners take note: your intake manifold was bolted down with bolts that included studs for mounting accessories. 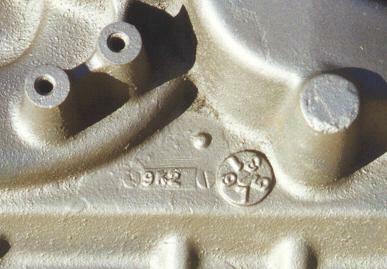 All 1969 and 1970 CJs have a studded bolt in the third mounting hole on the driver's side of the intake that was used to mount a bracket for the shaker hood scoop. Even Q-code cars should have this studded bolt because the engine assemblers didn't know if the engine would be going into a Q-code car or an R-code car when the engine was assembled. 1970 cars used a second studded bolt in the second bolt hole from the front on the driver's side that was used to mount the rev limiter ground wire. There were at least 3 different intake manifold castings used on the 428 Cobra Jet engine during its 2 1/2 year production run. 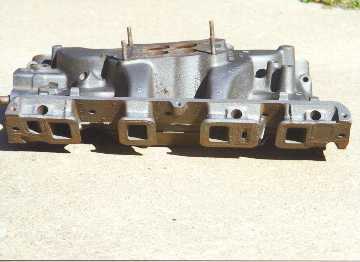 Two of these manifolds were cast iron but the third was the aluminum Police interceptor intake (C7AE-9425-F engineering number) used on some of the 50 Dearborn Mustangs with serial number beginning with "135". These cars were produced in late December of 1967 to legalize the 428 CJ for NHRA Super Stock competition. 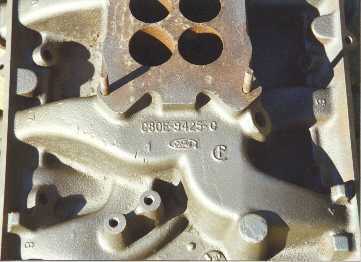 Ford records show that a C8OE-9424-A (C8OE-9425-A engineering number) cast iron intake manifold could also have been installed on some of the "135"-series cars. The -A intake was used again on some early production Cobra Jets. 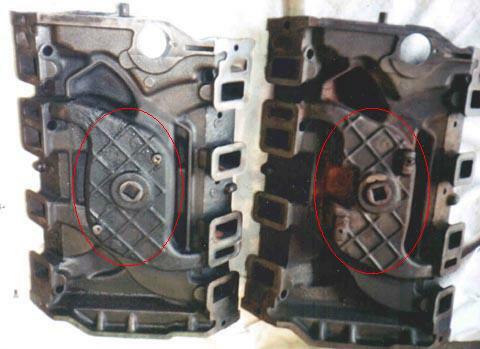 The first two pictures below show a -A intake manifold with an 8D8 casting date. It was originally installed on a 1968 Mercury 428 CJ Cyclone with a scheduled build date of 01E. If you look closely at the top of the No. 1 runner (circled in red) you can see that some engineering numbers have been ground off. It is difficult to tell whether they were ground off the intake after it was cast or if the numbers might have been ground off the mold pattern. This is the general location of the "XE" engineering numbers that appear in early photographs of 428 CJ equipment. The third picture (image provided courtesy of Paul Rosina) shows another example that includes a complete date code and revision level number on the #1 runner. The "normal" casting date found on this other example is 8C22. 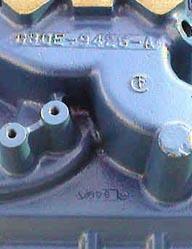 The next picture is a bottom view of this same manifold placed next to a later -C 428 CJ intake. The -A is on the left. Note that the -A is very similar to the C7AE-F Police Interceptor intake casting. The -A manifold shown here also has taller ports than a standard -C manifold but it is possible that this manifold was modified after it left the factory. 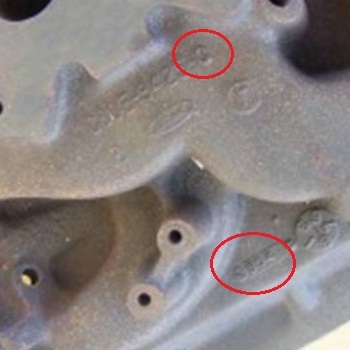 Obviously there was a "-B" revision to the 428 CJ intake manifold, but it is unlikely that any were produced as evidenced by the overlapping casting dates of the -C manifold with an 8D4 casting date shown in the picture below - which is 4 days earlier than the 8D8 dated -A manifold shown above. The next two manifolds actually share the same engineering number, C8OE-9425-C. Although the engineering number was not revised, there are some differences between early and later -C manifolds. The first picture (on the left) is of an early 1969 -C manifold that has an 8H7 casting date. Compare the top of the #1 runner to that of the later-C manifold shown to the right. This manifold has a casting date of 9A22. It is a minor detail but you can see the additional reinforcement at the intersection of the #1 and #5 runners (circled in red).